I used my Cricut and the Something To Celebrate cartridge to cut the cake. The tag die is from the Teeny Tiny Greetings stamp and die set at My Creative Time. There is a small little sneak peek of what is to come next week during Emma's new release with the sentiment I used below....I can't wait to share more with you, so be sure to check back next week. I used Card Patterns Sketch #164 for my card. 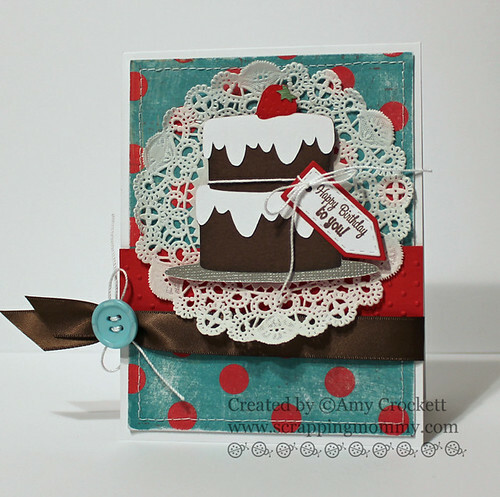 I am also entering this card in the Moxie Fab World Card Creations Week: The Doilies and Lace Challenge. This card is also perfect for the current Throwback Thursday Challenge going on right now at My Creative Time.....Emma is giving away a Cuttlebug to one lucky participant!! CLICK HERE to check out all the details and get your card linked up. And, don't miss out on the the release and blog hop next week. You have until Sunday (5/13) night to leave a comment under this post and I will draw a winner on Monday. Good Luck!! Have fun and don't forget to leave comments along the way!! What a gorgeous card!!! I love your take on the sketch! Beautiful pattern paper and all around awesome birthday card!! What a GORGEOUS card Amy!!! I adore this color combo! Fabulous!!! Amy, this card is BEAUTIFUL!!! I love the colors and the doily! This is so CUTE!!!! Love your card and the doily. So Pretty. Fabulous birthday card--the doily is perfect to showcase this wonderful cake. Love your card. The cake looks yummy. wow amy, your card is FABULOUS! Your cake card looks so yummy! Great job, love the doilie background. Wow!!! I just LOVE this and that beautiful doily! Great job Amy!! Very sweet! Happy Birthday to Emma! Adorable card! Love the colors you chose! What a happy card. That icing is incredible! Mmmmm. I love it! Your card is so cute and I love how it just pops on the doily. The colors are so fun and the polka dot paper is just darling! Now that's an Emma Birthday card!!! Fantastic job! Your Birthday Cake Card For Emma Is So Adorable!! She Is Going To Love It!! Very pretty card!! Love the colors! Amy ~ oh my this is just PERFECTION! From the cut, the sewing, the papers and that little sneak peak! She is sure to just fall in LOVE with this card ~ I know I did! I love using dollies on a card. Very nice. I love the doily behind the cake! Cute card. TFS. How beautiful! Love the lace doily!!! So pretty! Love your card Amy. I really like the doily behind the cake. So pretty. Love that yummy cake. TFS. Great card and colors! I'm a proud MCT customer and honored that y'all are doing this for the fans! Amy you did an amazing on this card! I love it and the doily is a great touch! thanks for sharing it! This is a beautiful card love it! Very cute birthday card. 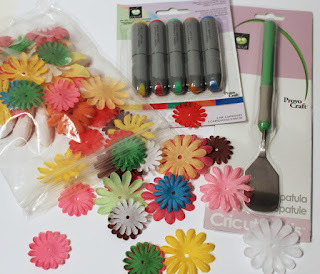 I think it is awfully sweet of you all to do a birthday blog hop for Emma. Wonderful birthday card! I really like the doily in the background -- it really adds a feminine touch. Happy Birthday to Emma! TFS and thanks for the chance to win! This is so fun! It looks super yummy! I love that little strawberry on the top! How fun, I am only on designer 2 and still blown away by the love you have for sweet emma. What great friends you are to her. That is quite a tribute:) Happy Birthday Emma! Your card is so stink in cute. Love the doily and the sentiment. the polka dots are fun too. Great card...looks good enough to eat :D Love the chocolate ribbon and dot paper. Your card is ADORABLE!! Yum, that luscious cake is actually making me drool and it looks so cute on the doily! Wow, looks good enough to eat!!! 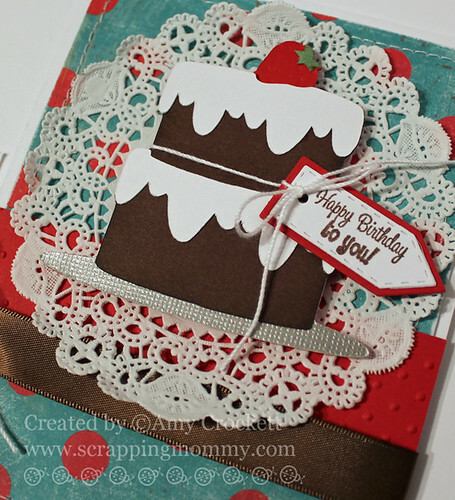 love how you used the doily, your card is lovely!! What a yummy, tasty chocolate cake. Let's party! Amy, your cards are ALWAYS so beautiful! What a FUN hop for such a special person! Hope you have a SUPER night! Wow, your card is just gorgeous! Great card, what a terrific way to celebrate her birthday!! I hope I win, this blog hop sounds like fun, fun, fun!!! You guys are an awesome DT!! I love your cake makes me want some strawberries and cake!! Yummy card. I love the doily and the brown satin ribbon. What a delicious card! Great work and would love a chance to win some goodies!!! Your card is gorgeous, it looks good enough to eat. Love the colors. Fabulous card- love the doily accents. Thanks for sharing it and for the chance to win. Fabulous card! Love all the different elements and the cake looks yummy. Thank you for playing along at Card Patterns! Love the card! The colors coordinate so perfectly. What a super sweet card. It looks good enough to eat. The doilie looks fab on there too. Thanks for the chance. Wow, I am so glad that you are doing this blog hop and that I found you!! Loven' your b'day cake card! So delicious!! Am a new follower, too! Happy Birthday Miss Emma. I love this card, the doily makes it perfect.